That might be shocking to younger people, especially anyone who fears old age. Maybe we fear missing out on opportunities in life, and worry that we'll find ourselves too old to do things. At 100 years old, or older, people don't seem to sit around and smile about the things they accumulated in life. Rather, it's more about their life experiences. Happy memories can go a long ways toward happiness later on! "I have so many beautiful memories," said a woman over 100. "I got to do all the things I wanted to." That tells us to jump in and live life - remember that it's about really living and making memories with people we love. "I've always been lucky," says one centurion despite living through 2 great wars! She also talked about how "everything makes me happy. I love talking to people... going shopping." Common advice from people who are doing well at 100 is to "Decide to be content." Others say, "Don't chase happiness. Just be satisfied." The past is the past; we can't change it. But we can rob ourselves of our present happiness and good emotional health by hanging onto old regrets, grudges, and pain. You'll gain inner peace, happiness and feel 'uncluttered' in your life. Centurions often talk about their "good" marriage, all their happy memories, and all their good times together. It's another area where they might be applying rose-tinted glasses, but it's apparent that they got emotional support and felt like they have a life partner. They also say that people today give up too easily these days-so there was hard work involved, but at the end of their life that part isn't really important anymore. "Being happily married and happy in general is the remedy for all illness." We don't have studies on how marriage or long-term relationships affect life span, but you don't have to be a scientist to take note: centurions all speak about their decades long marriage with a smile on their face. Many people who are 100 say they feel strong and like they're 69 or 79. These are the people who stay active physically and mentally, and have a lot to share with other people. "Life goes on regardless" is a common theme. People who live well into old age understand that there is hardship in life but they know life goes on and they must too. If you live 7, 8, 9, 10 or more decades, you're going to see a lot of change. People who adapt and change with the times do better. It's part of having a positive attitude-they're excited for new opportunities instead of fearing change. It's another common theme among people who live to be over 100. Being kind and helping others gives you a sense of purpose too, and it fights depression and anxiety. Not only that, it's a way of staying active and productive after you retire. It's a win-win for everyone involved, and being older and retired can mean having more time for volunteering. ...And people who live in the moment more tend to live longer, happier lives! When we disconnect from the mental chatter (the past, future, worry, expectations and judgements), we are able to approach life with greater perspective - we tend to see the opportunities, instead of carrying around the weight of worry and mental baggage. 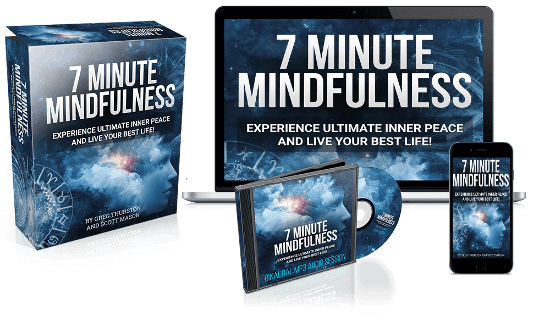 If you'd like disconnect from the mental chatter but don't have time for long drawn out meditation, then try 7 Minute Mindfulness. In just 7 minutes you can release the stress that builds up, wipe away the mental chatter, and relax your mind and body... so you can enjoy a long and prosperous life!